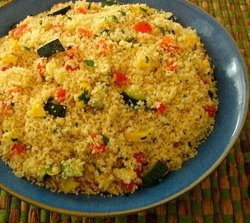 This video recipe for a vegetable couscous shows you a wonderfully simple method for enjoying all those delicious seasonal veggies that can be found at your local farmer's market. The irony here is that this video was shot quite a while ago, and features such ubiquitous supermarket produce as "so-not-local" green zucchini and bell peppers. This recipe was filmed for About.com last year, and is just now going live. Unfortunately, at the time a trip to farmer's market wasn't possible, and so a two-block walk to the local megamart had to do. That's not to say that this dish wasn't good, it was very good. It's just when I watch it now I'm imagining how awesome it could have been with some "real" vegetables (you know, like the ones grown in dirt, instead of hydroponic foam!). Enjoy! I like couscous with sausage (I mean a smoked decent version of sausage). Give it try - even if your neighbour at BBQ will suspect you of being a lunatic. There is something about couscous it that combines really well with homemade sausage and chilled lager. I haven't been on you site in awhile... Glad to see you are still posting great recipes and videos! Nice job. Chef John You are incredible i didn't know cheese was even makeable thanks for great ideas and greal recepies! I have some leftover leek from the pasta primavera recipe (turned out awesome btw! )...can I use them for this recipe?